Last weekend I visited Two Little Red Hens for the first time in over a year. I went with a small group of people who were all connected to food businesses or food-related web sites. It was late afternoon on Saturday and the line was out the door–much to the dismay of some local residents. While we were on line we listened to a few tell everyone how indignant they were to have to wait on line for a cupcake. Nobody in our group seemed to mind the wait. I think this was because the wait gave us more time to do what we love–talk about food–then eat it! Cupcakes: As (all ten of) my loyal readers know, I don’t feature cupcakes very often but when I do it’s because I think they’re something special. 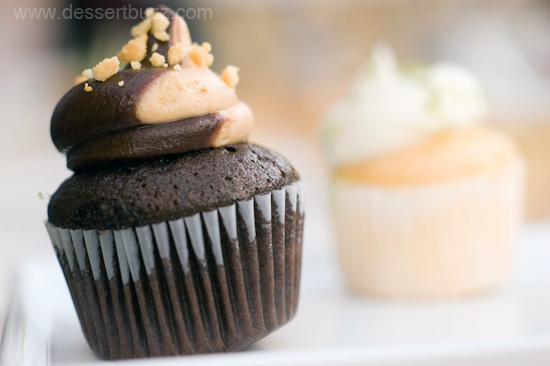 That was the case with both the peanut butter and key lime cupcakes from Two Little Red Hens. From the photos you can tell they were crafted with an attention to detail that you don’t often see at other cupcake-specialty shops. The peanut butter cupcake had a really nice whipped peanut butter cream inside that was light but still had a strong peanut flavor. The frosting on top was a twist of chocolate and peanut butter–it was smooth the way it should be. This is in contrast from the many of the toothpaste-like frostings you experience in NYC. 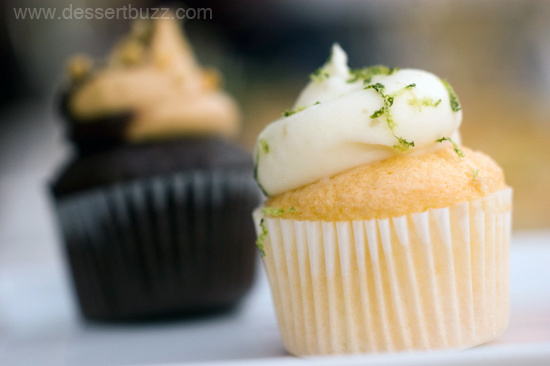 The key lime was also very good and particularly light for a cupcake–a good choice if you don’t consider yourself a “cupcake person”. 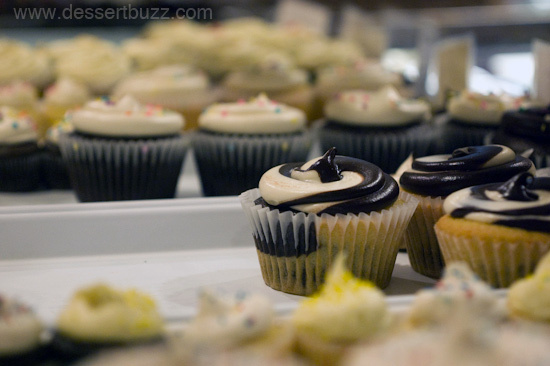 The signature item from Two Little Red Hens is the Brooklyn blackout cupcake. It’s a chocolate cupcake with chocolate frosting and a whipped chocolate ganache-like filling. 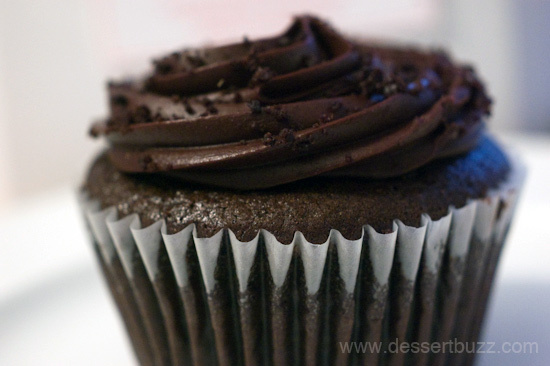 To me, this cupcake is no different than a really well executed chocolate cake–it was moist and the center filling had a great chocolate flavor. If you are only getting one thing from Two Little Red Hens this is what you should buy–either the full-size or the mini. Scones: If you like scones (and I do) you owe it to yourself to visit Two Little Red Hens when they open (7am on weekdays, 8am on weekends) to buy yourself a “tri-berry” scone. 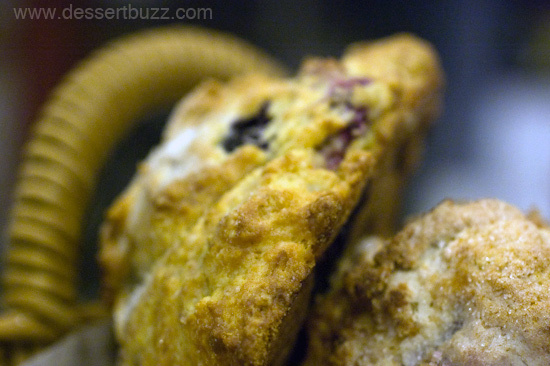 When freshly baked, these are one of the best scone experiences in NYC. Well-baked and crusty on the outside and soft and moist on the inside. The inside reminds me of the middle of a good buttermilk pancake. I wasn’t able to try their pies but I did try a bite of their cheesecake and it was excellent. 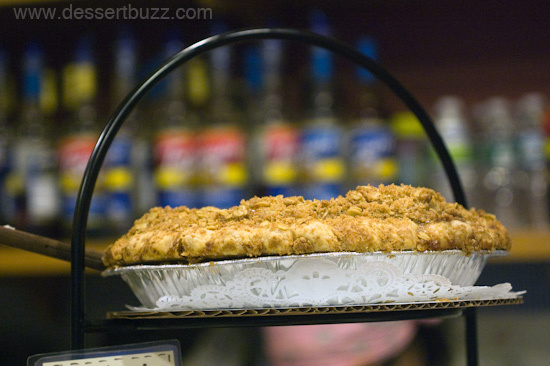 Two Little Red Hens is located at 1652 2nd Ave (86th St.) Their website is here. Follow DessertBuzz on Twitter. Loyal reader #8 checking in. Your description of the peanut butter cupcake had me licking my chops. Sounds really good. Loyal reader # 8 how did I not get this notification? This place is great–lines are for a good reason.